Hyperopia, also known as longsightedness, is a vision problem that is quite common. It affects nearly a quarter of the world’s population. For the most part, people with hyperopia have the ability to see objects in the distance very well, but have a hard time seeing objects that are close up. People who are longsighted often suffer from eye strain, headaches or feel tired after doing a task that requires close range focusing, like reading or computer work. They may also find themselves squinting to see better as small print up close becomes blurred or doubled as they read. 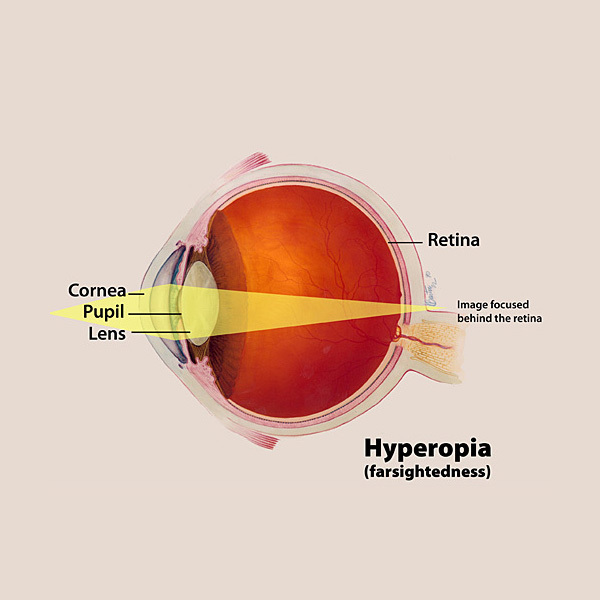 Hyperopia occurs when rays of light entering the eyes are bent by the lens as though they were coming to a focus behind the retina, instead of falling directly upon it. Not surprisingly, a longsighted eye is often shorter than average, or the lens is flatter and less capable of bending light. Hyperopia is usually present at birth or develops shortly afterwards. Some children outgrow the condition as the eye grows normally and begins to lengthen. However, many people require reading lenses to see clearly up close both in childhood and throughout their lives. Hyperopia is often confused with presbyopia, which can also lead to problems with near vision, but for different reasons. Hyperopia is usually detected during a regular eye exam with the same techniques and instruments that are used for detecting astigmatism and short-sightedness. Your optometrist can estimate the amount of longsightedness present by using a retinoscope. This procedure involves introducing different lenses in front of the eye while shining light in at the same time. By observing how the light behaves when reflected in the patient’s pupil with different lenses, hyperopia can be diagnosed and measured. Many optometrists supplement, or replace, the retinoscope with instruments that are automated and provide a quicker way to test. However, whichever test is done, the optometrist will refine any preliminary findings with a detailed manual test method called refraction before giving you a lens prescription. Hyperopia can be treated by wearing glasses, or contact lenses, that change the way rays of light are bent when entering the eye. Glasses, or contact lenses, with a plus powered prescription lens are used to correct longsightedness. You might need to wear them only at certain times, like reading, or all of the time if you are very longsighted. In some cases, LASIK refractive surgery can also correct longsightedness, and may eliminate the need to wear glasses or contact lenses altogether.